When an automated module action fails, it is added to the Module Queue. Events that can fail and go into the Module Queue include Hosting Account Creation, Suspension, Unsuspension as well as Domain Registrations, Renewals and more. The admin dashboard will indicate when an action has failed via the Pending Module Actions badge shown below. To resolve it, visit the Module Queue either by clicking on the badge (pictured above) or by navigating to Utilities > Module Queue. 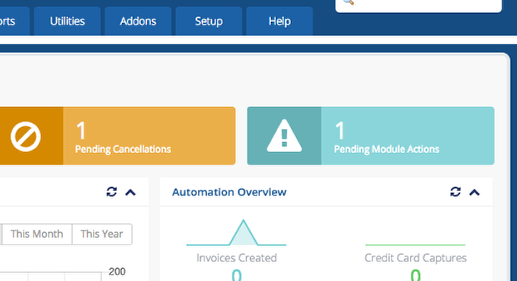 The list of automated actions that have failed and need attention will be displayed, along with the error code returned by the module (highlighted below). In this case, the issue is the automatically generated username is a reserved username. To resolve it and allow the creation to be successful, we must change change the username to a valid value. To do that, click the Product Name which in our case is "Home", and that will take you to the Manage Product/Service screen. From here we can update the username and hit Save Changes. Now return to the Module Queue and hit the Retry button. 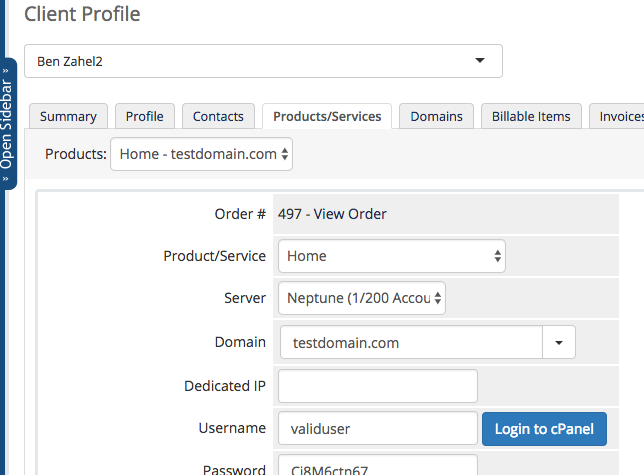 WHMCS will attempt to perform the account creation again and the outcome of the attempt will be displayed on screen. If you see a green success message like the one below, then the account has been successfully created.